If you want your veggies to stay farm-fresh, store them properly and you will be surprised by their preservation ability. Like carrots– did yo know that they can last in storage for 3-5 months? To keep veggies fresher for a longer period, follow these simple and natural tips. There is really nothing worse than getting a large assortment of delicious and farm fresh veggies from the local farmer’s market, only to watch your produce wilt and perish because you simply couldn’t keep up! What a horrible waste! Luckily, there are ways to prolong the freshness of your veggies. It is our goal to provide you with some simple ways to keep your farm fresh veggies alive longer! Check your veggies and identify which ones are the most perishable, and use those first. Save the hardier stuff for later use. This seems like an obvious and logical choice, but often we use our veggies without planning ahead for future meals. 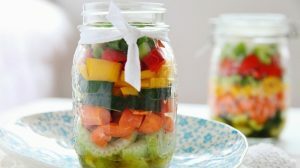 Try to plan meals several days to a week in advance so you can gauge the veggies you will need for each recipe, and from there you will develop the habit of cooking easily perishable veggies earlier in the week. Aspire to find some new ways to consume your veggies when you get them. Search the Internet for some great recipes to avoid veggies sitting for a long while. I tend to find that I often rotate the same recipes every week, and I get it, we all get busy and fall back on the tried-and-true recipes that we know our families will eat. However, changing it up can be a great way to consume all the same favorite standby veggies while exploring other flavors. How about trying a delicious chutney recipe? I’m sure you’ve heard the rage about kale and spinach, and honestly, these two veggies are incredible at producing some of the most delicious smoothies around. I used to always think that a ‘smoothie’ meant only fruit. But in recent years, I have become a big fan of mixing in fresh veggies with a blender or juicer. Smoothies are very easy to make and a healthy drink. So try making veggie smoothies or juices! Got vacant areas in your garden you’d like to fill? Wondering if there are vegetables that’ll do well being planted this late in the summer? If you live in USDA zones 4,5, and 6 you are in luck! Just head over to our bio, click the link, and have a #happyhomesteading day. Refrigeration can substantially slow down respiration and break-down processes of your farm fresh veggies. When veggies get cold and the molecules in them slow, this, in turn, slows down the decomposition process. Most of your farm fresh veggies would love the cool temperature of your refrigerator. Here’s what you can do to maximize your refrigerator’s shelf life. Place your refrigerator in a location with enough air space to allow it to operate properly. Your instruction booklet will show details for the clearances required. Keep your refrigerator unit away from very hot places, such as next to an oven or clothes dryer. The reason behind this is that your refrigerator is already working against the average room temperature to keep the contents cool, so you don’t want to make it work even harder to cool against appliances that heat. 5. Keep Your Refrigerator Clean! Defrost regularly! It is a very good idea to thoroughly clean your fridge out several times a year. I know it seems odd, and this is activity may not be fun and enjoyable, but it sure is beneficial! This is a must if you really want your food to last longer. A clean fridge equals fresh veggies, so it’s worth it! Use a refrigerator thermometer. Your thermometer should display a temperature below 5° in the main section of the refrigerator. Something to watch out for is a refrigerator that does not cool evenly throughout. This can lead to having one side that is entirely too cold, and spoiled produce on the other. These types of refrigerators will not be effective in maximizing your veggie lifespan. Make sure that there is a good air circulation around each item inside your refrigerator. The proper way of storage doesn’t just keep your food in great condition and safe from food poisoning bacteria. It also spares you shopping time and helps you to save money because it lessens waste. So don’t carelessly throw your veggies in the fridge, place them with enough space to allow for even cooling. As soon as you as notice any spoiled veggies, dispose of them immediately. This is a must, because rotting veggies have a negative effect on veggies that would normally last longer. So remove the rotting veggies before it begins to spoil the rest of your produce! Never store farm fresh veggies directly in the fridge. Keep veggies like cucumber, beets, broccoli, greens, peppers, all roots, and even corn, loosely packed in plastic bags. This way, there is a barrier between the fragile skin of your veggies and the frigid air around them. This also helps to hold on to the natural moisture of the veggies. Separate edible greens from crops like radishes, carrots, beets, and kohlrabi, before putting away. The greens are constantly looking for their next water source and the root veggies store water. The greens will drain moisture out of the roots if left attached. So be sure to separate them! For better circulation, make sure to remove rubber bands, twisty ties, and other fasteners from your veggies. While these are used in the selling process to easily measure and weigh your produce, these bindings don’t do your veggies any favors. These ties will not allow for even or proper circulation of air or temperature. The key to good veggie keeping is consistency. I always used to think that the fruit and veggie drawers in a refrigerator were for convenience and organization. However, the fact is that vegetables and fruits produce a gas that can be detrimental to their counterparts. The following fruits and vegetables produce ethylene gas that can cause your remaining veggies to spoil and change in flavor, especially sensitive greens. I know it may be more convenient to chop your veggies in advance from time to time, but generally speaking, unless you are going to use them soon, it’s best to wait to chop until you are actually going to use your veggies in a dish. The additional water will make conditions that are excessively damp and not perfect for fresh, crisp, tasty vegetables. If you cannot avoid washing vegetables before storage, ensure to dry vegetables as much as possible and store them in a dry paper towel. Most of your farm fresh veggies would love the cool temperature of your refrigerator, but not all. The following crops need to be kept out of the refrigerator to maintain prime freshness. Tomatoes – will lose its flavor and texture when chilled, so just refrigerate if you wish to stop from immediate spoilage. Basil leaves – quickly turn shrunken and brown if stored uncovered in the fridge. The perfect way to store basil is in a container with water. Sweet Potatoes – will get chilling abuse if you put them below 50 degrees. It is better to store them in paper bags or baskets. Winter Squash – will also get chilling abuse if you put it below 50 degrees. Around 55 degrees would be fine, however you kitchen countertop will do, so long as you use it in a few weeks. Peppers – cut it into large pieces and freeze directly. Freezing herbs in water in ice-cube trays, leaves chopped, make cubes that are great for adding to soups. You can also freeze them loose in a bag and take ‘em out to chop up later. Tomatoes can be frozen as is, whole. Their skin will peel off when thawed. Core or chop if desired. Berries are perfect for freezing because they make deliciously thick smoothies! Shear them first to take off inedible pieces like stems and pits. Freeze on trays or freeze in serving-size bags. And there you have it, folks! I hope these tips are beneficial for you as you continue to buy and store farm fresh veggies! Did you find it helpful and interesting? Let us know what are your thoughts are about these natural ways to keep your farm fresh veggies longer in the comments below. Editor’s Note – This post was originally published on October 2016 and has been updated for quality and relevancy.